Ole Gunnar Solskjaer was asked about the future of Marouane Fellaini during Friday morning’s press conference at Carrington. The Norwegian said nothing has been confirmed yet and asked for his conversation with the player to remain between the pair. While Solskjaer didn’t really add anything to the Fellaini speculation, it’s clear the Belgian will move on soon after passing a medical ahead of his transfer to Chinese club Shandong Luneng. Fellaini has spent over five-years at Old Trafford, winning the FA Cup, League Cup and Europa League during that time. 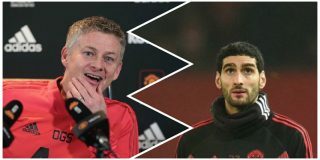 Caretaker manager Solskjaer would have dismissed reports if he thought Fellaini was staying put, but he’s paid respect to the player by keeping their conversation confidential. The Belgian was primarily used as a Plan B option during his time at Old Trafford, with former manager José Mourinho arguably getting the best out of the midfielder, who took instructions well while United played a more conservative brand of football. But under Solskjaer things have changed. United look to fill the midfield with more technically gifted players to bring more creativity to the side. Fellaini is no longer part of the club’s plans so it’s the right decision to move him on.